Exchange Season 2016/2017 is knocking on the door. Below you can find the list with the contracts for the next season. You must have passed first semester to apply for a research exchange and third semester – for a professional exchange. 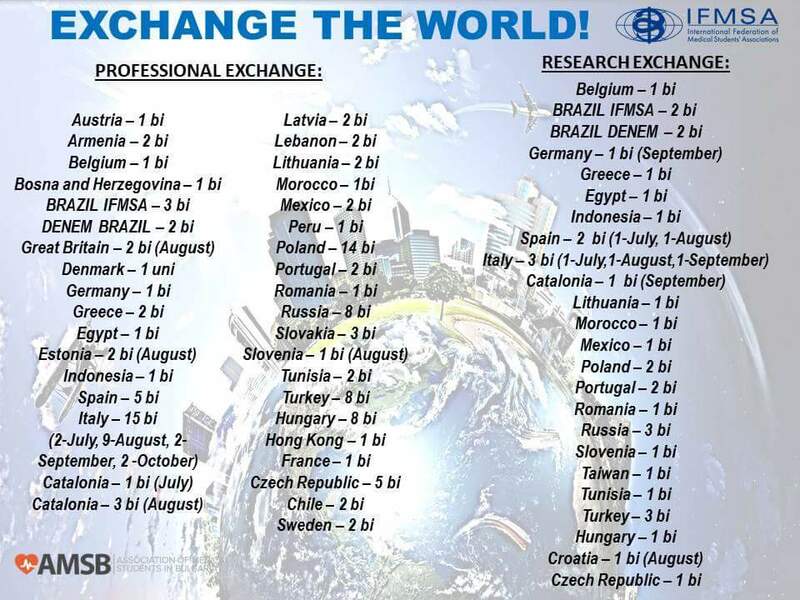 To apply for an exchange, you must to fill in the following Form and to send all your documents (diploma from the secondary school, language certificate, certificate for participation in conferences, congresses, IFMSA meetings and training, AMSB meetings etc.) to the email: exchanges@amsbulgaria.net . Period to apply 31.10.2015 – 12.11.2015 23:59h. The results will be published on 16th of November. If you have any further questions, don’t hesitate to ask your local officers (LEO – Professional Exchange & LORE – Research Exchange).